The purpose of this section of the website is to provide the user with contextual historical information that will help them make sense of the interviews we conduct. In planning the website we decided to include an historical narrative that went back to the end of WWI and the creation of Czechoslovakia, but that focused on events surrounding WWII. 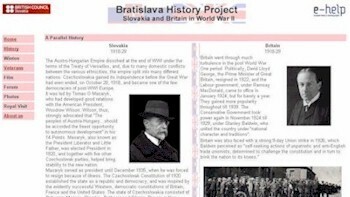 The core section of the narrative is a hypertext parallel history of the two countries written by IB historians at the British International School of Bratislava. In addition, there are a number of specialist articles that seek to expand on the core parallel narrative. These have been written by students in all the participant schools. The hope is that the number of these articles will continue to expand over the length of the project.